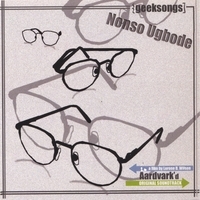 Humor and hilarity ensue with this compilation of songs written for geeks around the world, for the hit film 'Aardvark'd: 12 Weeks With Geeks'. Most of the songs are written to give a thoughtful edge to a subject matter many would not consider serenading - computer programmers. It accomplishes its eccentric goal admiringly with simple songs, which help give more dimensions to a beautiful film. Little known singer/song writer, Nonso Ugbode manages to accomplish this only with guitar and an often cleverly used voice. Somewhere in between smiling and actually feeling touched, you'll most likely want another listen on songs like the cleverly busy "Vibe," and the simple "Binary Code (Makes Sense Wherever I Go" and the lingeringly haunting "Digital Cowboy." This is a well thought out album and testament to the spirit of independent production on which the American music industry was built on.